Photos, from left to right, of dry swale, wet swale, and step pool. Images courtesy of Limnotech. 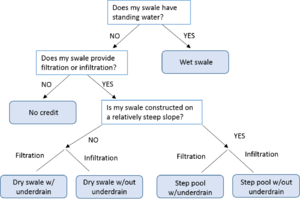 Flowchart used to determine type of swale. Click on image to enlarge. 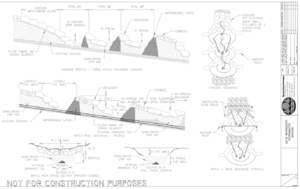 In the following discussion, swales are identified as filtration or infiltration practices. Swales are considered filtration practices when an underdrain is employed and infiltration practices when an underdrain is absent. Impermeable check dams may be utilized for either configuration. Engineered media is typically utilized in filtration swales and not utilized for infiltration swales. The flowchart to the right provides a way to differentiate between types of swales used as stormwater best management practices (BMPs). Section drawings are included on this page. For images of various swale details, link here. This section describes the design variants used in this manual. Other names occur in the literature but they can be fit into one of these variants, as described below. Typical dry swale profiles and sections. Diagrams include dry swales without underdrain (infiltration) and with underdrain (filtration). Click on image to enlarge. A dry swale without an underdrain is a relatively shallow, gently sloping, vegetated conveyance channel that prevents standing water via infiltration into in situ soils. This type of practice may be used in tandem with check dams to increase water quality volume retention. Infiltration is the dominant unit process for stormwater control. A dry swale with an underdrain is a relatively shallow, gently sloping, vegetated conveyance channel that has an engineered soil media mix and is designed with an underdrain to prevent standing water due to insufficient native soil infiltration rates. This type of practice may be used in tandem with check dams and/or impermeable liners. Filtration is the dominant unit process for stormwater control. A wet swale is a relatively shallow, gently sloping, vegetated conveyance channel that holds water. A wet swale acts as a relatively long and linear shallow biofiltration treatment system, and may be used in tandem with check dams to increase water quality volume retention. Wet swales may be planted with emergent wetland plant species to improve pollutant removal. Settling and nutrient uptake by plants are the dominant unit processes for stormwater control. A step pool with no underdrain is a type of conveyance channel used in areas with steep terrain that uses a series of pools, conveyance channels, and checks to slow down water and increase infiltration into in situ soils. A step pool with no underdrain is similar to a dry swale with no underdrain, with the main difference being the step pool is employed on relatively steep longitudinal slopes. Infiltration is the dominant unit process for stormwater control. A step pool with an underdrain is a type of vegetated conveyance channel used in areas with steep terrain that uses a series of pools, conveyance channels, and checks to slow down water and is designed with an underdrain to prevent standing water due to insufficient native soil infiltration rates. A step pool with an underdrain is similar to a dry swale with an underdrain, with the main difference being the step pool is employed on relatively steep longitudinal slopes. Filtration is the dominant unit process for stormwater control. It should be noted that the layout of the swale area will vary according to individual sites, and to specific site constraints such as underlying soils, existing vegetation, drainage, location of utilities, sight distances for traffic, and aesthetics. Designers are encouraged to be creative in determining how to integrate swales into their respective site designs. With this in mind, the following are presented as alternative options. On-lot systems are designed to receive flows from gutters, and/or other impervious surfaces. These applications of swales tend to be simpler in design and relatively smaller in size. 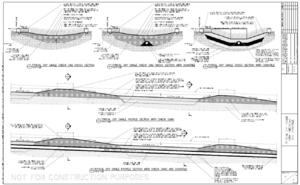 In a paved area with no curb, pre-cast car-stops or a “ribbon curb” can be installed along the pavement perimeter to protect the swale area. This application of swale should only be attempted where shallow grades allow for sheet flow conditions over level entrance areas. Water may be pooled into the parking area where parking spaces are rarely used to achieve an element of stormwater quantity control beyond the confines of the swale surface area. For curb-cut entrance approaches, the water is diverted into the swale through the use of an inlet deflector block, which has ridges that channel the runoff into the swale. Special attention to erosion control and pre-treatment should be given to the concentrated flow produced by curb-cuts. 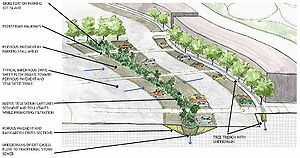 A multifunctional landscape can be created by utilizing road medians and islands for swales. There is no minimum width recommended for traffic islands from street edge to edge. A buffer may be necessary along the outside curb perimeter to minimize the possibility of drainage seeping under the pavement section, and creating “frost heave” during winter months. Alternately, the installation of a geotextile filter fabric “curtain wall” along the perimeter of the swale will accomplish the same effect. Virginia Cooperative Extension. Virginia Tech – Virginia State University. Urban Stormwater: Terms and Definitions.